While addressing a $500.00 a plate Democratic Party fundraiser in a private Kalorama home in Northwest Washington Michelle Obama threatened to leave after lesbian Ellen Sturtz, 56, interrupted her remarks to demand that President Obama sign an anti-discrimination executive order that would prohibit federal contractors from discriminating on the basis of sexual orientation or gender identity. “(This is) One of the things that I don’t do well,” Mrs. Obama said loud over the microphone. “She came right down in my face,” Sturtz said. “I was taken aback.” Sturtz said she told Obama she was happy to take the microphone to plead her case, which, Sturtz said, appeared to fluster the first lady. “I said I want your husband to sign the executive order,” Sturtz said. “Her husband could sign this order tonight and protect 22 percent of the work force in this country.” Sturtz was then escorted out of the room by security. Later in an in an interview later she was stunned by Mrs. Obama’s response. The incident came hours after White House press secretary Jay Carney reiterated the president’s focus being on legislation for any type of ENDA protections through Congress even though two past Presidents in the past have signed Executive Orders barring discrimination against race, color, and creed by companies that hold Government contracts. After the incident Mrs. Obama did not mention ENDA or an Executive Order completely ignoring the incident and going back on scripted message. I have said it before and I will say it again. It should have been Hillary in 08. Video – Mrs Betty Bowers America’s Greatest Christian Is So Close To Jesus That…. I’ve been saying it for the last 5 years too! It’s interesting that she invokes children’s issues as the ones that matter and, seemingly chastised the crowd for daring to even think about raising other issues that might be pertinent to them and THEIR children. And, who does she think kids are going to become if discrimination is allowed to continue as usual? It’s deeply ironic that a person who is a member of a class of people who have been historically oppressed, and continue to be so, is luke warm on the mechanisms that would alleviate oppression of another class of people. Of course Ellen Sturtz is right, the President only needs to sign an Executive Order and the whole work-place discrimination i at an end… BUT were there is only ONE President, and there is no First Lady President, it is the President who signs such an EO! I think it was wrong by Ellen Sturtz to tell the 1st lady that her husband must sign such and EO! 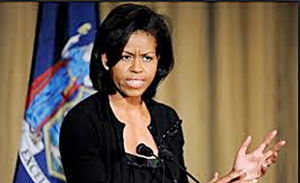 And of course Mrs. Obama talks with Mr. Obama, about matters that she encounters, and no doubt she will have mentioned the “incident” to Mr. Obama (in bed or at souper, or at diner…….. or for all I care in the limo that took her home), but she. Mrs Obama is NOT to influence the President on matters of state! And people should not demand from her to tell the President to do or not to do anything! I think she, Mrs. Obama reacted perfectly, putting Ellen Sturtz in her place, or better said perhaps….. told her were the facts are clearly and not to misunderstood words! Some groups lack tact in handling situations properly. It may bring the issue up, but to what cost. Ms. Obama handled herself perfectly and Ms. Sturtz needs to apologize. There are ways to be recognized without showing a lack of respect for those who have worked so hard to be in positions that can actually help a cause. Kudos to Ms. Obama for showing a heckler the door!